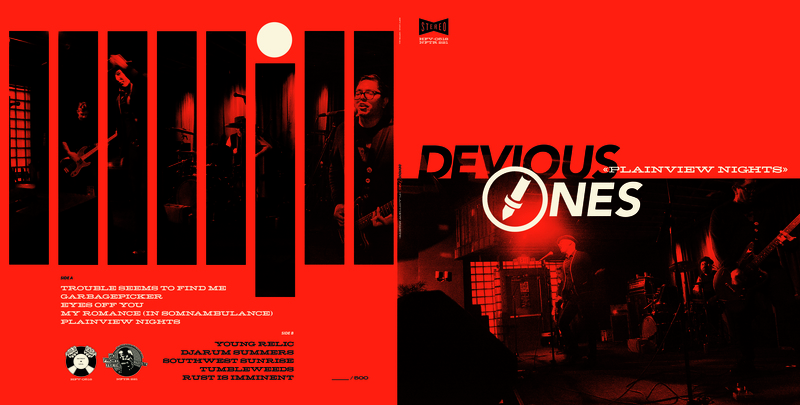 Hold Fast is honored to present to you Devious Ones’s debut LP, “Plainview Nights”. With members hailing from the notable groups as the Murder City Wrecks, The Putz, Mog Stunt Team, and Bill Bondsmen, Devious Ones have been delivering speedy, sonic spiciness to stages across the Midwest over the past few years. So, it only makes sense that after a series of tasty seven-inch treats, Hold Fast is proud to present “Plainview Nights” to turntables worldwide with the help of our U.K. friends at No Front Teeth Records. On their debut album, Detroit’s Devious Ones send out 10 tattered & tapered love letters to the sights, smells, and sounds they cut their teeth on. Ranging from the rough jangle of “Trouble Seems to Find Me”to the anthemic “Rust is Imminent”, the band takes you on a wild ride through their lives & times. Sure, it’s 3 chords with the 4th on layaway. But, these tracks are hip shakers & heart breakers. This is our noise. This is our wave. “Plainview Nights” is perfect for refined palates that enjoy the robust flavors of Buzzcocks, Marked Men, Simpletones, The Damned, and Forgotten Rebels. “Plainview Nights” is available in two editions totaling only 500 pieces in this first pressing.